To create this traditional, all-natural basket, weavers use strips of naturally waxy palm fronds wrapped around coils of wild grasses. Dyes are made from organic materials as diverse as flower petals and mud. 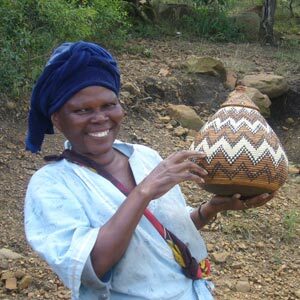 You will receive the exact basket pictured above, woven by Gladys Ntombela. 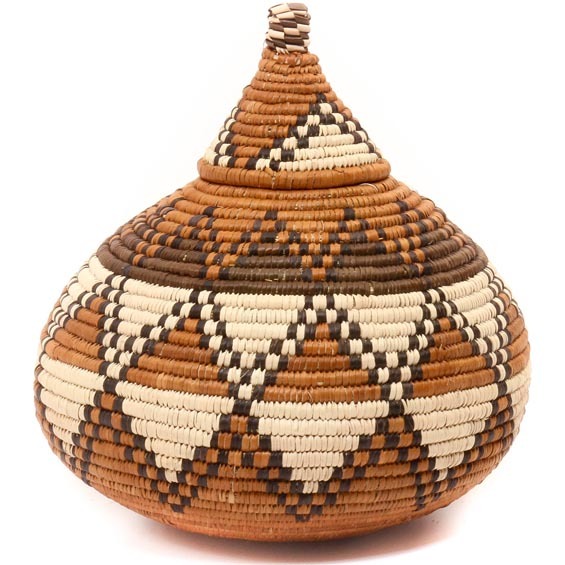 Smaller Ukhamba baskets like this one are sometimes called "beer baskets." Ilala palm baskets are still used for liquid storage in some rural areas of South Africa. Watertight baskets are readied by rubbing wet cornmeal inside. When liquid is added, the coils swell. Some liquid leaks through the coils and evaporates, which cools the contents. Large baskets are traditionally given as wedding presents, and the patterns and designs on the basket carry cultural significance about the ceremony. These baskets are all-natural. The dyes are made from materials as diverse as flower petals and mud. Some colors are very rare due to difficulty in obtaining enough of the dying materials, other colors are only available certain times of year when specific flowers bloom or other conditions are satisfied to grow and harvest the materials used in the creation of the dyes. Collection of these baskets in Zululand, South Africa is challenging to say the least. Hundreds of miles are driven on dirt roads to go village-to-village and hut-to-hut collecting baskets from each individual weaver. The quality of weaving and size of basket combine to determine prices on these stunning creations.